In 1854, James Reader left his parents in southern Wisconsin to pursue the dream of striking it rich in the California gold rush. Rather than traveling overland, he came around the horn on a ship into San Francisco with little but his dreams of hitting the mother lode. A young man with no family of his own yet, James didn’t need much except the spirit of adventure and grit necessary to stake a claim in the foothills of the Sierra. When he arrived, he quickly got a job at a trading post that outfitted miners about halfway between Nevada City and North San Juan. Shortly after, James bought the land, closed the outpost, and established Reader Ranch, a legacy that has lasted for six generations. Around the same time that James left home, a young woman named Almina Judd made a similar journey with her own parents via Panama. She met and then married James, and the two had five children; four girls and one boy. The “gentleman bandit” was known for his poetic messages and was one of the most notorious stagecoach robbers to operate around Northern California and southern Oregon during the 1870s and 80s. While employed at the sawmill, “Mr. Martin” would leave for a couple of weeks at a time on “business trips,” conduct his criminal activities, and then return to work and live on the Reader property. Needing a way to haul the lumber from the sawmill off of his land, James next started a freighting business with the main route from Wheatland to Graniteville. At the age of 13, James’s son Frank, who was born on the ranch in 1870, started driving a freight wagon for his dad and ran the main route. They would haul lumber from the sawmills in Graniteville to their land, and started homesteading other pieces of land around the property. “At one point, James had claimed several thousand acres along the Yuba River, but let all of that go because he thought, ‘Why would I want to be paying taxes on this, I’ll never use it,’ and so he brought it back to 1,000 acres in the 1870s,” said John Reader, great-grandson of James and one of the current owners and caretakers of the Reader Ranch. Being an industrious and resourceful man, James also had teams of horses that he would rent out for work. He also continued to do some mining along the creek; trying spots that hadn’t been worked before, but it didn’t make a lot of money. Along with these businesses, James and Frank ran up a good head of over 200 cattle. The Reader ranch is located five miles south of North San Juan, and the closest community in that day was French Corral, to which the oldest of James and Almina’s children would ride on horseback to go to the store. The remnants of towns that we see today were booming during that time; the hills alive with the hustle and bustle of mining life. Although it wasn’t far, the family didn’t get to Nevada City much because there were thriving communities all around. As time went on, the gold ran out, mines stopped hydraulic mining and those once-booming towns dwindled at the turn of the century. Just as that began to happen, in 1898, James passed away. “We are so lucky that he put that legacy together and we’ve been fortunate to keep it going for all these years,” John said. After James passed, his son Frank kept up the ranch and took care of his spinster sister. He had three other sisters who had married and moved away from the family home, but the siblings remained close. So when Frank got married in 1902 at the unheard of age of 32 years old, it sparked a bit of a feud between him and his sisters. The three sisters who were married and gone had assumed that Frank would stay single and take care of his last spinster sister, and so were upset when he got married because they wondered who was going to take care of the unmarried sister? Frank and his bride spent their honeymoon night at the National Hotel in Nevada City, and when they came home the house was completely empty. While the couple had been honeymooning, the other sisters came, took all the furniture and belongings and left the house completely empty. Frank sold the cattle off at that point, but kept up the freighting company. He settled the estate with his sisters, and then bought them out and lived there happily with his wife, and soon after, children. In the springtime, Frank would sublease the ranch to sheepherders who would bring big bands of sheep that were migrating through to go to the high country. Frank continued this until his son, Francis, born in 1914, became a young man and, along with one of his sisters, decided to get back into cattle in the 1930s. The brother and sister started buying cattle to build up the ranch, both meat stock and 14 dairy cows, which he milked by hand and then sold the milk. Francis’s sister eventually got out of the business and so Francis took it over and built the herd back up to what it is today. He lived there on the ranch until he got married in 1948, at which time he and his wife built another ranch on McCourtney Road in Nevada City. Although he moved away, Francis continued to help his father with the Reader Ranch. But in 1955, Frank was slowing down and needed more help than he had before, so Francis built a second house back on Reader Ranch and he, his wife, and their children, including one-year-old son John, returned to the family plot so they could be there to help out. That one-year-old baby, John, is still living at the ranch and keeps up the family business with his brother Fred Langdon, although all of the siblings co-own the business. 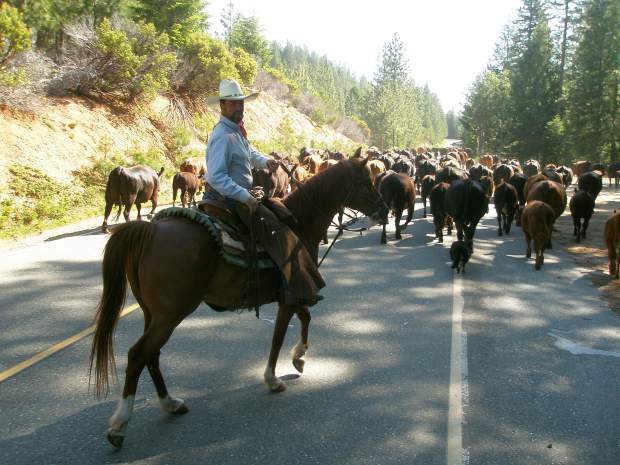 In fact, this past Labor Day weekend, John led the annual cattle drive for Reader Ranch, which is believed to be the last cattle drive in Nevada County. Taking care of the cattle is a year-round process. In the springtime, the cattle are trucked from the winter pastures to a field in Pike, where John along with his son have to put bells on each cow and then drive the herd on horseback to the summer range, which is located between Camptonville and Allegheny, which takes a day. At the end of summer is the biggest job of the year. John, Fred, and other family members and crew have to gather the cattle from 18 square miles. After they are gathered, the cows are driven by the Readers on horseback from the gathering fields back to the ranch. To do so takes three days, John said. John still lives at the Reader Ranch, as does his son with his own wife and three children in the house that John himself grew up in. Although his son commutes to Sacramento each day to work at the concrete company he is part owner of, he is always on hand to help out with the cattle and ranch chores when he’s at home, and takes part in the cattle drive each year. John’s five-year-old grandson loves to help out at the ranch, the sixth generation to do so. “He follows me around, trudging along and helping to irrigate,” John said. Although no one knows what the future holds, John marvels at the changes that have happened in the world since the Reader Ranch was established nearly 150 years ago. The ties to history and family cannot be denied at the Reader Ranch, and one thing that John stresses is that it is important to be good stewards of the land so the ranch can last another six generations.